Re-reading Georgette Heyer’s work in advance of Blue Plaque Day has been an unexpected voyage of discovery. I’ve loved her books for ever, of course. But typing out an extract from AN INFAMOUS ARMY gave me a real jolt. It is the morning of the battle of Waterloo. Some men, sleeping out in the cold and wet, have died in the night and everyone is sodden: old soldiers became busy drying their clothes and cleaning their arms; young soldiers stared over the dense mist in the valley to the ridge where the French were beginning to show themselves. Read it aloud, as I did. In two paragraphs she gets all the terror of the impending battle, the imminence of death, the fear of the raw recruits, the numbness of those who have been here before. And I realised exactly what makes her such a brilliant writer for so many different sorts of readers. It’s in the things she doesn’t say. As Browning had it, she does the thing shall breed the thought. Then there comes that little electrical charge between what she has written and your imagination and suddenly, there you are, seeing what she saw, feeling what you feel. Consider what Sarah McConnell was saying, in response to my last post, about that agonising scene in SPRIG MUSLIN. We readers have had a picture of Lady Hester – whose family think she’s a born spinster. She runs her father’s household and is regularly called in to nurse or babysit by her married sisters. She’s past the first blush of youth, not very pretty, turned down the only proposals of marriage she ever received and is really a bit vague. Then, suddenly, rich Sir Gareth Ludlow with whom she has been friends ever since his spirited first love died, proposes. She turns him down and he, being a reasonable man, sets out the advantages of the match: her situation is not happy, she would be at no one’s beck and call, with a position of the first consequence and a husband who would not make unreasonable demands. This seemed so strange a thing for her to have said that he thought he could not have heard her aright. ‘I beg your pardon?’ he said blankly. No more words but it’s all there: the pain of unrequited love and, worse, the sheer awful loneliness of pain unacknowledged and unacknowledgeable. In a sentence. God, she was good. George’s face twisted. He came quickly back into the room and laid his hands over both Hero’s and gripped them. ‘I know,’ he said in a moved voice. There was an uncomfortable silence. And you see that they are not just daft any more, not even George Wrotham who has been stamping about like Lord Byron at his worst and generally making a cake of himself over the Beauty. The feelings are real. They hurt. You don’t want to spend too much time there, any more than you want to press on a bruise, but you know. That was when it occurred to me – what a total gift to a film maker. The delicious prose, the mock heroic authorial comments, no you couldn’t put those on the screen. But these moments of truth coupled with some of the best dialogue outside Restoration Comedy or PG Wodehouse – what a treasure trove for a screen writer, for an actor. 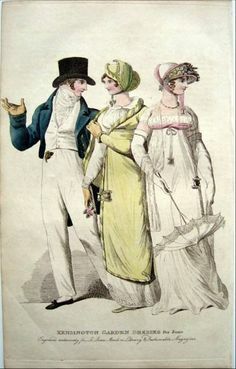 Of course, those wonderful Georgette Heyer readers had got there first. There’s even an online petition you can sign. It had 1,238 signatures when I found it. Now it’s got one more. 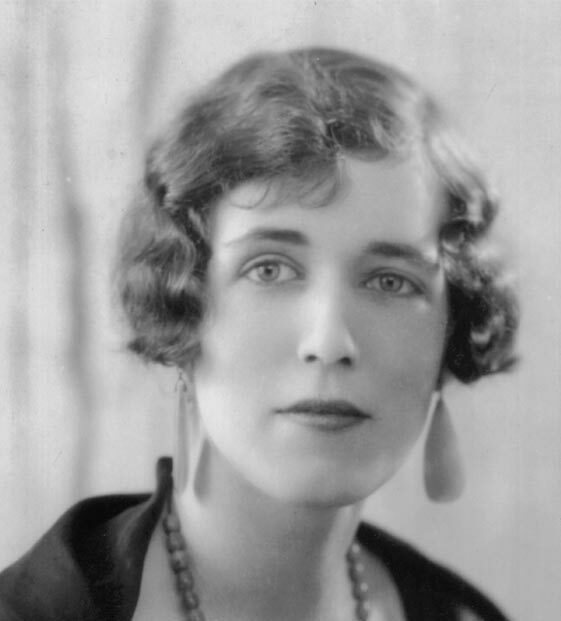 Fans of Georgette Heyer will feel a quiet sense of satisfaction at the news that English Heritage are to place one of their Blue Plaques on her first home in Wimbledon next month. It is another step towards the public acknowledgement of a truth which, if not yet held universally, has been acknowledged by countless people all round the world for a long, long time. She is a Treasure. Carmen Callil, a woman of whose publishing achievements I am in awe, allegedly opined that Heyer took Jane Eyre and rejigged it 57 times. Not true – Heyer never really hit the Gothick note. And even her most enigmatic and brooding hero has a sense of the ridiculous, which neither Mr Rochester nor Jane quite manages. But I completely see why a lively feminist publisher would take agin books in which the highest good to which the heroine aspires is marriage to an eligible –i.e. always wealthy, often titled — man. More seriously, an Editorial Director I much admire told me a few years ago that Heyer had badly needed editing. I don’t know how that would have played with the strong-minded Heyer. From her career-long vituperative joust with the respected editor of Woman’s Journal, Dorothy Sutherland (who tried) I suspect that Heyer wouldn’t have put up with it. And if a publisher insisted, it might have shut her up for good. The loss doesn’t bear thinking about. Mind you, Sutherland’s preferred title for Regency Buck wasn’t great, even without the connotations that have accrued to it since 1935. And her strap line? Words fail me. –in the Dare-Devil Days when Men Were Men and Women Seductively Coy! So what is the evidence that Georgette Heyer is a Treasure? Well, many, many authors love her – and not just those writing in the Regency genre like New York Times Best Seller Jo Beverley but Booker Prize Winner A S Byatt*, Kate Fenton, Emma Darwin . (Note the span of generations there.) And many more. I admit to being comforted when I found that Heyer, too, played patience while theoretically writing. If it was good enough for Her . . . But I don’t mean to talk about my own opinions here. These are not my ideas, but those of her millions of readers. For since the Blue Plaque announcement, I have been trotting through the Forest of Internet in search of Heyer fans and found — well, overwhelmingly more than I expected. Of course there are the Heyer Appreciators, many of whom are to be found at Almacks. And from Mumsnet through The Guardian to Jane Austen blogs and uncountable numbers of bloggers — some loving her for ever, some just discovering her, some arguing furiously over where she did and didn’t do what they wanted (Smart Readers Trashy Books is really good at that) — Heyer’s work is considered seriously by a very high class of reader indeed. They are thoughtful, principled and often terrifyingly well- informed. I take my hat off to them. she crosses generations – I noted how often the commentator found Heyer’s books on the shelf of a mother, grandmother, family friend or shared the long loved pleasure with a daughter or granddaughter. Don’t think they missed much. We should all have such readers. Hope Miss Heyer would have appreciated them. Attendance at the blue plaque unveiling is now up to capacity. I’ll maintain a waiting list, if anyone would like to come and doesn’t mind waiting to see whether there’s room. Sorry about that, but delighted that so many people want to come and celebrate Georgette Heyer and her work. *Byatt, A. S. “An Honourable Escape: Georgette Heyer.” Passions of the Mind: Selected Writings. London: Chatto & Windus, 1991. 258-65. —. 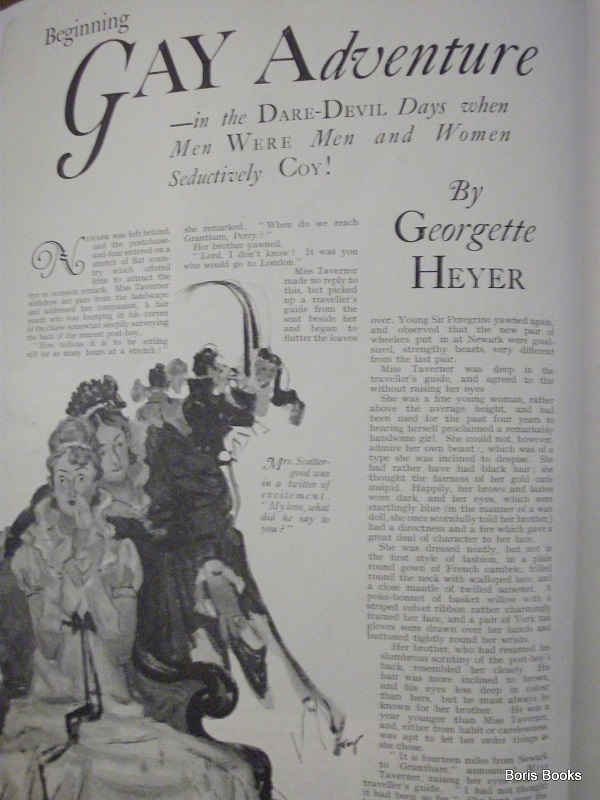 “The Ferocious Reticence of Georgette Heyer.” Sunday Times Magazine 5 Oct. 1975: 28-38. Rpt. 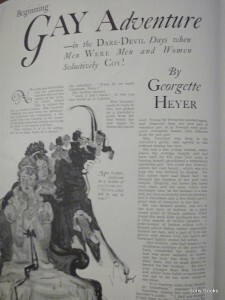 In Georgette Heyer: A Critical Retrospective. Ed. Mary Fahnestock-Thomas. Saraland, AL: PrinnyWorld, 2001. 289-303.